What has more play potential than a rainy day? Peep and Ducky return in a splashy story that begs to be read aloud. 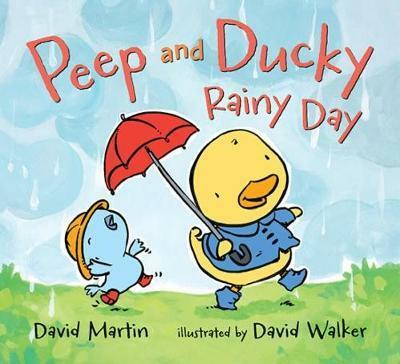 When Peep visits Ducky on a rainy day, the little pals have no trouble finding things to do. Inside, there is a tent to build and a pillow fight to be had. And outside, with the help of galoshes and umbrella, it's fun to captain a boat--until a whoosh of wind and a clap of thunder sends them running back in! Perfectly tuned to a toddler sensibility, this exuberant tale will enchant both listener and reader. Totally in tune with toddlers, this snappy read-aloud gets it right. --Kirkus Reviews (starred review) Once again, these two buddies provide a concise, realistic portrait of the ups, downs, and compromises inherent to friendship. --Publishers Weekly This makes a perfect read-aloud for story hours or lapsits, especially for preschoolers just beginning to navigate friendship interactions. --Booklist Online Children will have fun looking at the pictures and the text works well as a one-on-one read or as a selection for a rain-themed storytime. David Martin has written many books for children, including the first to star this feathered duo. He is also the author of Let's Have a Tree Party!, illustrated by John Manders, and All for Pie, Pie for All, illustrated by Valeri Gorbachev. David Martin lives in Vermont. David Walker has illustrated Bears in Beds, Bears in the Bath, Bears on Chairs, and Bears and a Birthday, all by Shirley Parenteau, as well as Flip, Flap, Fly! by Phyllis Root. He lives in Chapel Hill, North Carolina.